Mulberry-Whin - Driffield - Yorkshire - England. We have three onsite accommodation options. Imagine waking up to a hearty breakfast before taking the short 5 minute walk down to the stream! 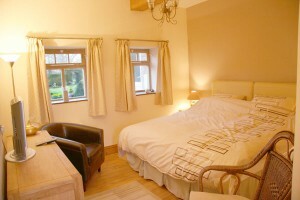 We are proud to offer Whin Lodge for onsite B&B accommodation. Imagine waking up to a hearty breakfast before taking the short 5 minute walk down to the stream. The room is a twin/double with the large beds able to be separated if you don’t want to sleep too close to your fishing buddy. For those wanting to stay 2 nights or more, or those with a party larger than 2, we are very proud to offer Mulberry Cottage. The cottage is a barn conversion and consists of three double bedrooms (1 ensuite), a large living area, kitchen and family bathroom. 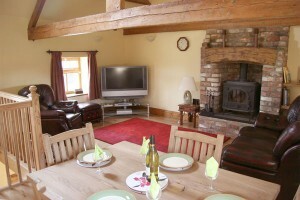 Prices for the cottage are available on request and depend on the number of nights and number of people wishing to stay. Take a look through the pictures below for more details. The Old Pantry is a newly converted self contained bed and breakfast room. The room can be booked as a single, twin, double or as a family room with a sofa bed sleeping up to 4 persons. 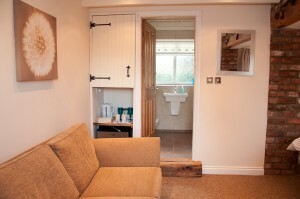 Ensuite bath and shower, tv with dvd player, mini-fridge with tea and coffee making facilities and free wifi connection.